This is the second super on a colony. The bees have worked up into the second super after only about one week. This is a package I started on drawn comb from my April 25th delivery. This nectar flow is maybe going to be a great one. The weather is great, we have ample moisture, and the hives have been building up nicely. The basswoods are blooming in the west metro and mine here in Stillwater should be blooming by Tues. The warm days and nights hopefully will make the basswood flow. If that happens the supers will fill quickly. Right now I have several colonies with two supers and with honey in the boxes. I have added two more supers on them. It is important to stay ahead of the honey coming in because a super can be filled in less than a week. Supers go on two at a time. Drawing new foundation in the supers? Put foundation directly on top of the brood nest. The bees will draw it out better. When ever hives are in a straight row there is drift of the bees. The bees tend to move to the outside hives. The hives in the center get weaker the outside colonies get stronger. When hives in lines get like this the simple fix is to move weak colonies to the outside and strong colonies to the middle. This will even out the populations. One way to manage this is to not put hives in long straight lines. Offset the colonies to break up the line. My Catalpa tree is in full bloom. Usually when that is blooming the nectar flow has begun. I think everyone in the metro area should be seeing something. If you don't have supers on, they have to go on NOW or your hive may become honey bound with no room for the queen to lay. 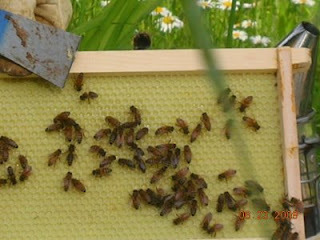 Anyone doing comb honey I would wait until honey is in the supers before putting on the comb honey frames. The basswood and linden trees should be blooming within a week. If they produce a good flow everybody will be entering a perfect capped frame of honey (deep, medium, or both) in the State Fair. First prize is $75.00 in each of these two categories. How to win? Enter online at the MN State fair website. Look in the premium book under bee class. Follow all the instruction in the category you are interested in. This is competition so make it nice. It is fun to compete all your friends and family will come to the fair to see your entry. Terry has forwarded a new video of various observations. Her queen is beautiful. This article has comments from some local beekeepers Bob Sitko, Dan Malmgren and studnets from the U of M.
We talked to Bob's wife Darlene today. Bob is sitting up and working with a physical therapist to regain strength. Bob and Darlene are very grateful for the cards and she read each one to him. Please keep the cards coming. Bob said right now his bees are good. He has supers on all his colonies. I checked my swarm hive today. I had put a super on last Sat. 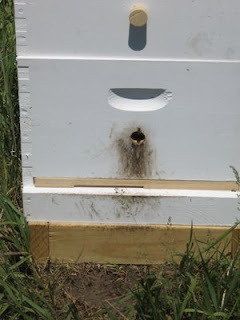 I noticed that the bees were in the super starting to draw comb and putting up honey. 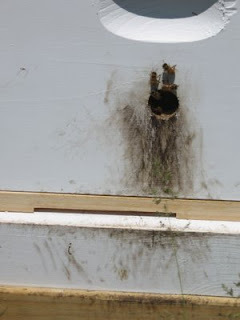 When it gets hot like this bees will leave the hive and cluster under the front of the bottom board or will be all over the front of the hive. This is normal. They are cooling off. Some bees are still inside, their numbers are not needed to cover frames to warm brood. The outside air temperatures will do this. Hot weather can make the bees slip into swarm mode. When it gets into the 90's bees don't seem to collect much nectar. It is like they are using there energy to cool the colony. Also the bees can get really cranky when hot. A safety note. A sweaty bee suit that is dripping wet, bees can sting through a wet suit like there is no suit even there. We heard from Bob's wife today. She reports he is doing better today. He would love to receive some cards at the address on the previous post. The family still requests no visitors. We want to let you know that Bob Sitko is in the hospital with serious heart trouble. Looking at a frame of new honey. I should bring this frame to the State Fair. First prize in the honey frame competition is $75.00. I checked my swarm today. The queen is laying and they have put up some honey. I had this beekeeper take it home and put it on a weak colony of his. Hopefully he will get some honey off of the combined colony. I checked my bee today. They were packages from the April 25th delivery. Most of them looked great. All of them are in two deeps on drawn comb. I have fed very little because I had frames of honey in the hive when I installed them. During my inspection I had some that were heavy with honey the others had ample food. The bees are perfect for the nectar flow. Great populations and heavy already with food. I put honey supers on all of my hives and removed all the entrance reducers. I looked at the weather forecast and it seems some very warm and humid weather is coming next week. If your hives have a good population it might be a good idea to remove the entrance reducers. Nothing puts bees into swarm mode than a hot hive. Swarming is getting into high gear. I have collected three swarms so far. I have had several calls from the public about swarms in trees. An inspection for swarm cells with a 7-10 day schedule will catch queen cells before they are capped. If you see capped swarm cells in your hive, it has more than likely swarmed. Hives with two year old queens are more prone to swarm than hives with new queens. A hive that has swarmed will usually not produce much excess honey. The swarming season usually lasts until the nectar flow starts coming on strong.. The nectar flow is coming. I stole that title line from Basil Furgala. I think everyone should be close to being done on drawing comb. ( If they kept feeding syrup). When the deeps are basically done at being drawn out it is time to do the last reversal of the season. Bring the bottom deep to the top and the top deep to the bottom. This is to get the darkest comb in the top box. The the top box will get full of honey for winter stores. 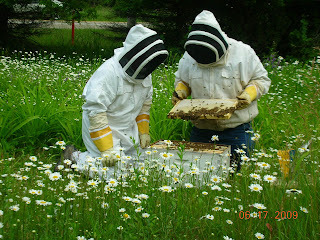 Bees will move up on to dark comb in January easier than white comb. It is best to put the honey supers on sooner than later. Put them on two at a time If the nectar flow is intense at the start, the bees can fill up a box in a week. I did see some clover blooms on my lawn and some yellow sweet clover in the ditches. The farmer down the road has cut his hay field. Things are progressing, now with the recent rain I am hopeful for a decent nectar flow. Black Locusts are blooming. They are a large white flower mass. That hang down off the tree. Black locust are a very good nectar plant. If you are lucky enough to have a few of these trees near the bee yard they will make a decent amount of honey. http://en.wikipedia.org/wiki/Black_locust here is a link for more information. What does skunk trouble look like? This hive is being hassled by a skunk. The scratch marks and muddy calling card has skunk written all over it. Notice how the scratch marks are at the entrance only. The skunk will show up every night at the same time and scratch the entrance. As the bees come out to investigate they become dinner for PePe Le'Pew. A skunk will depopulate a hive and it will become a very weak hive..
Another symptom of a skunk is the bees will be agitated when you work them. Notice the grass beaten down in front of the hive. Solution, fence out the skunk or get rid of the skunk.